Members of the Whitworth University Forensics team walked away from the Linfield College tournament Nov. 10-12 in McMinnville, Ore., with dozens of awards. The team brought home 13 speech and 13 debate awards. The Arguing Bucs took fourth place overall out of 32 schools, finishing ahead of regional rivals Oregon State University, Pacific University, Utah State University and the University of Oregon. Tucker Wilson, ’20, led the way by winning both junior impromptu speaking and duo interpretation (with his partner Sara Muscente, ’19), and by taking fifth place in both junior extemporaneous speaking and junior after-dinner speaking. He was awarded the Brenda Marshall Award for outstanding student in the junior division. In the senior division of debate: Rylee Walter, ’19, took second place. Jacob Farrell, ’19, and Sara Muscente, ’19, were quarter-finalists (top eight). In the novice division of debate, Daniel Giorello, ’21, took first; Brendan Thompson, ’21, took second; and Sanjay Philip, ’21, and Sean Duarte, ’21, were quarter-finalists. Philip took second place and Duarte took sixth in the speaker awards. In speech, Eric Anderson, ’21, came in third in junior impromptu, Sean Duarte took fifth place in novice persuasion, and Jacob Farrell took fifth place in persuasion. Sara Muscente and Tucker Wilson, ’20, won duo interpretation. Jess Lewis, ’20, and Calvin Payne, ’21, were the top junior-division competitors in duo interpretation. Lewis also won dramatic interpretation. Sanjay Philip placed second in novice extemporaneous speaking. Brendan Thompson placed sixth in novice informative, fifth in novice extemporaneous speaking and third in novice impromptu speaking. Alumni Kym Carnahan Davis, ’95, Ellie Probus, ’16, and Lori Welch, ’90, were guest judges for Whitworth. The next tournament will be held at Pacific University in Forest Grove, Ore., in January. 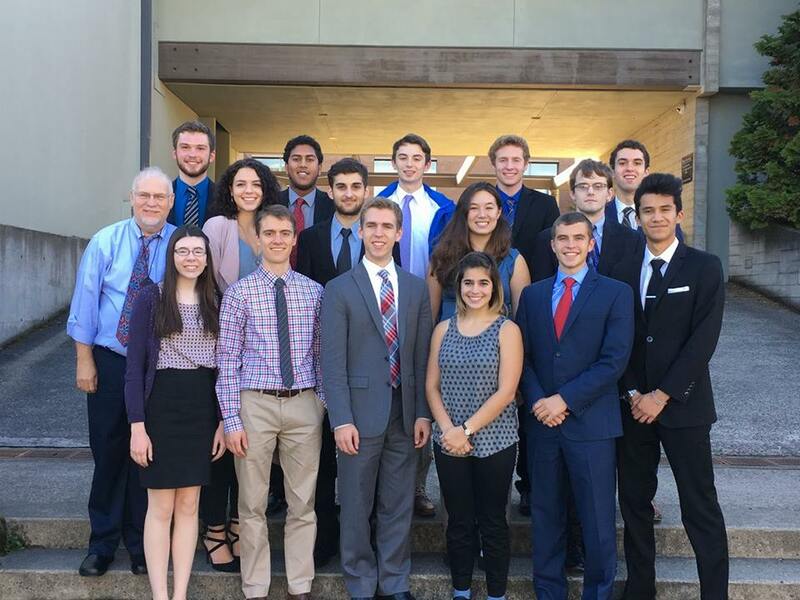 The team is coached by Mike Ingram, professor of communication studies and director of forensics, and Micah Allred, ’17, assistant director of forensics.